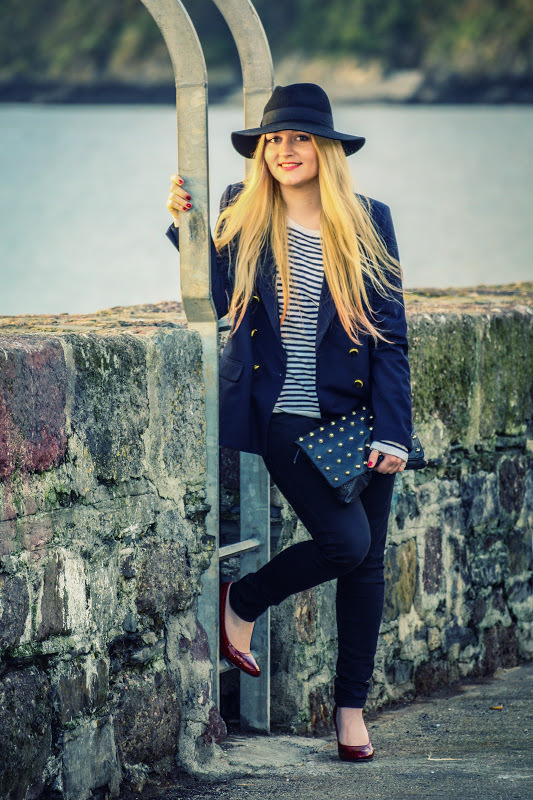 From all on trend Fashion items it's great to have navy blazer in your wardrobe. You'll have a polished finish on any outfit — from the most basic jeans and tank to your cutest dresses. I have exciting news. I'm announcing a giveaway this week, so stay tuned !!! I could not agree more. A navy blazer is such a classic and timeless piece. I love the pop of dark red color. Hello beautiful I ' d say! You look fab in this outfit! lovely look! I love your hat and your blazer! Gorgeous outfit! I really like the attention to the details! Gorgeous as always! Love how you styled these blue items with red shoes. I hope your thumb gets well soon! This is so chic Ramona! I love how you stuck with classic elements but threw them together in a very unique way. wow! This look is so great! 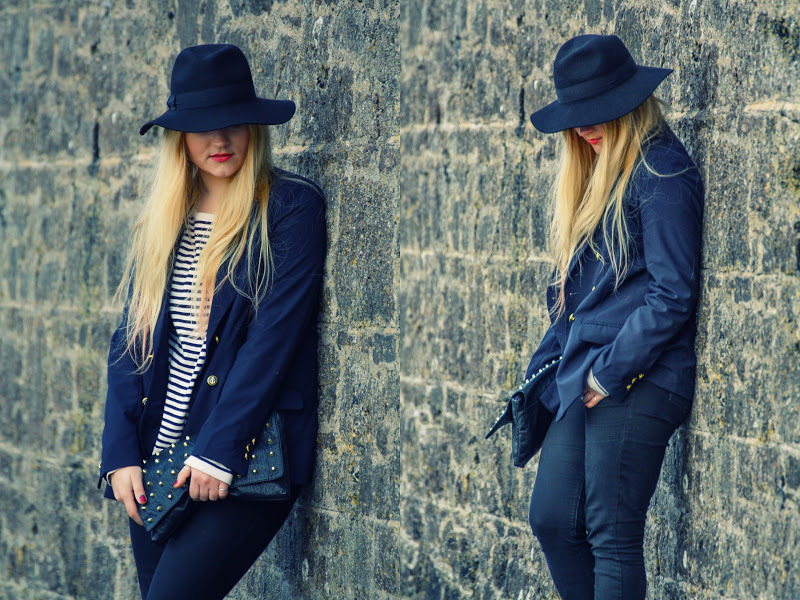 agreed that everyone needs a navy blazer in their life! New fan and follower! mmm that is a great hat!!! wow ilove your snake skin heel so much! love this sailor ispiring post! Love the sailor details! So pretty! Your hat is so cute! I love hats, they add so much interest to an outfit! And not everyone can wear hats, soy kudos to you for pulling it off. I absolutely love this look! That jacket is perfect on you! Beautiful ! It's classical and also very moden in the same time ! Great outfit. Sailing style never goes out of style, right :)?! I love that blazer and the hat really suits you :). so cute!! love your post! I've been looking for a navy coat like crazy but the only ones I found are black or cobalt =(, I love navy and you look fab as always!! Love the hat! So great. Awesome blog you have here as well! Love the all blue outfit with pop of red. Also, that bag is stunning! You look fantastic! What a great outfit! Love the styling! Yes, that pop of red is perfect! I love the nautical look! 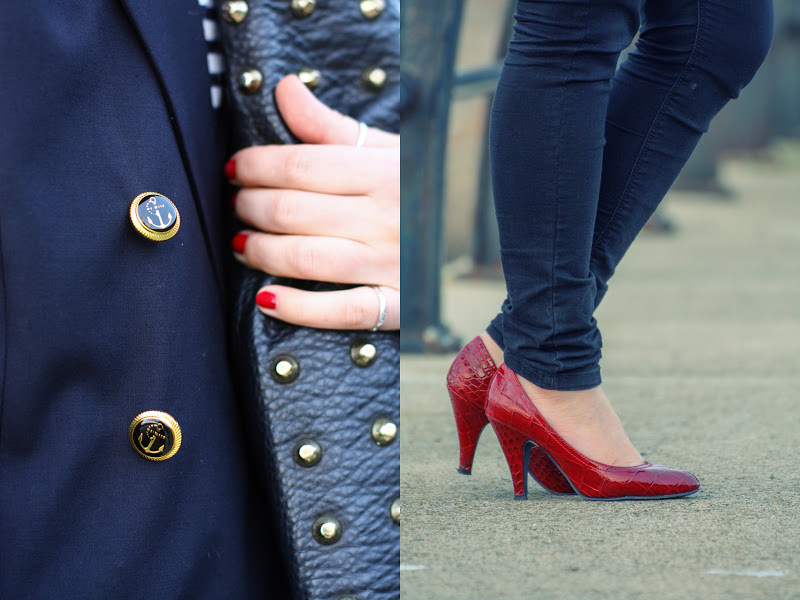 I love a navy blazer with gold buttons. I haven't found one yet that is to my liking. I love your bag from penny's! Hello Ramona! I'm glad to hear that you are doing better! What a nice outfit: I have a soft spot for stripes because they always add a quirky touch and the fedora hat is such a classy accessory! You are right about the blazer, it is a great classic and I hope I can get the one in the Maison Martin Margiela Collection for H&M...will see! Blue clutch purse is awesome. I like the dress also this bag is just perfect for keeping your essential items within safely and comfortably. wow amazing! i adore your hat and heels!